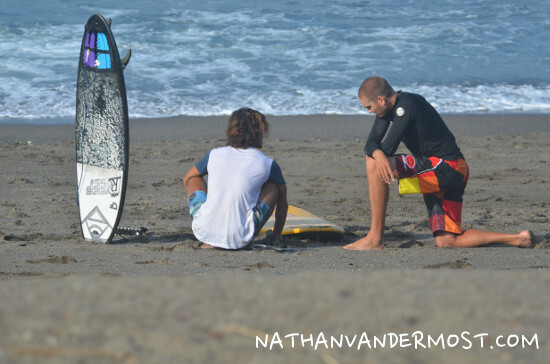 I arrived to Bali on a Thrusday and I had signed up for a surfcamp that started the following Monday. I was staying at a hostel in Canngu and met some fellow travelers whom were friends named Patrick and Patrick (not joking) that were going to Uluwatu and so I decided to join them. 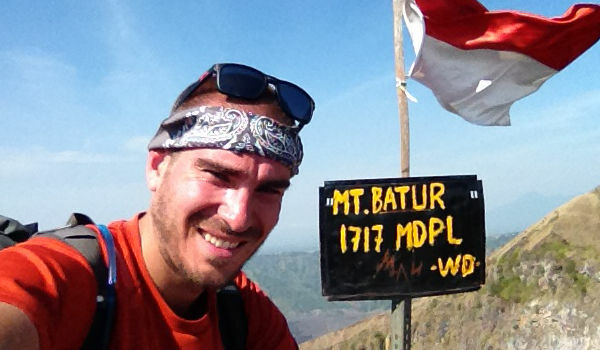 Each of us had rented motorbikes from a local family in the area called, “Wayan’s Guesthouse.” The cost was 40,000 Rupiah or $3.28 USD per day. The price decreases if you rent for an extended period of time. The rental comes with a helmet and local registration. The family is very hospitable, reasonable and speak good English. There were three of us in total and one of the Patricks had been to Ulutwatu before so he vaguely knew the way. 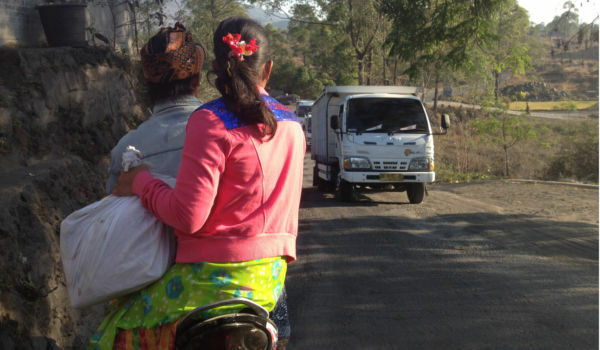 The roads on Bali are horrible and traffic can be insane so we agreed to get an early start. 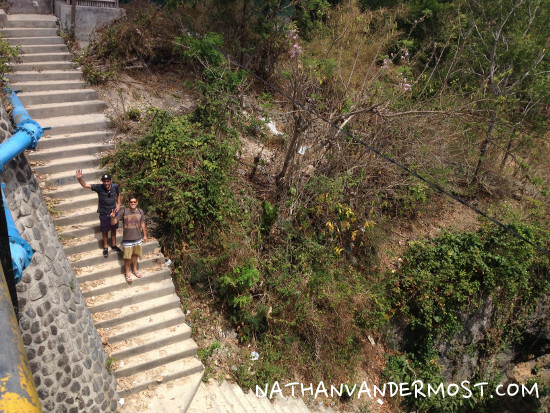 We left the hostel around 7:30am and it took about an hour to get to Uluwatu. Leaving early was a great idea because we were able to beat a lot of the traffic headed towards Kuta, the main economic hub on the island. 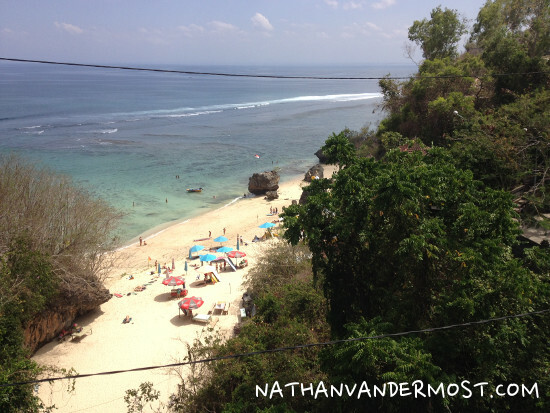 We took the main road to Kuta and then got on the expressway towards Uluwatu. I was in the rear, following both Patricks the whole time. Once the road gets to the southern end of the island and south of the airport. 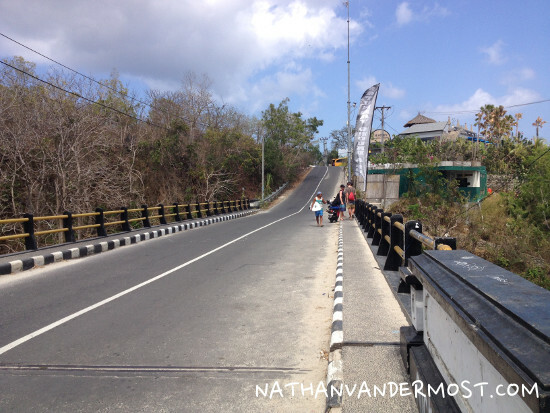 The road starts to climb as the southern part of the island is on an elevated plateau. The road is narrow and windy so drive with caution. Since we had not eaten, we found a cafe on the side of the road to stop for breakfast. By the time we had finished, it was roughly 9am. We were headed to Blue point bay to watch surfers. As we got closer, one of the Patricks motorbike ran out of fuel. His fuel gauge had broke so it was not as easy to keep track. The other Patrick and I cruised down the road a bit further and were able to pick-up a plastic bottle of fuel to bring back to him. He refueled and we continued on our way to Blue Point Bay. 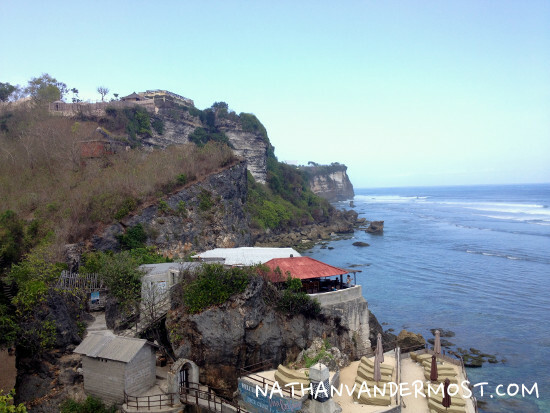 The parking for Blue Point Bay is right next to Puri Uluwatu Villas. If Patrick had not been able to lead the way than I would have had to refer to my smartphone map. Once you park, you may be approached by a Balinese local to pay 2ooo rupiah or $0.16 USD for parking. Following, there is a walkway that leads down a set of large stairs. 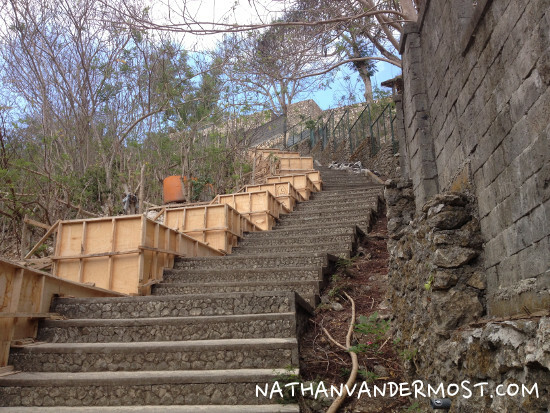 There appears to be old plywood molds next to the stairs as depicted in the photo above. Once you reach the bottom the the stairs, you walk a little further and reach a viewing platform of Blue Point Bay. It is a spectacular view of the blue ocean speckled with surfers catching big surf. The surf during this time of year is not particularly big for this area but still makes for a great view. There are plenty of surf shops, restaurants and accommodations in this area if you wish to stay longer. After taking in the sites and enjoying the view we went to another area called, Padang Padang . It was a short drive from Blue Point Bay. It is easily marked by a bridge that you have to cross over. After crossing the bridge there is motorbike parking on the left. 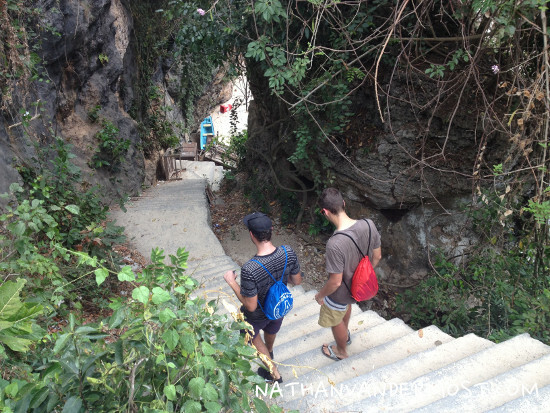 The beach is an easy walk down a set of stairs to a picturesque beach. I also noticed a natural bouldering for rock climbing so if you are a rock climbing enthusiast then this would be a great place to check out. 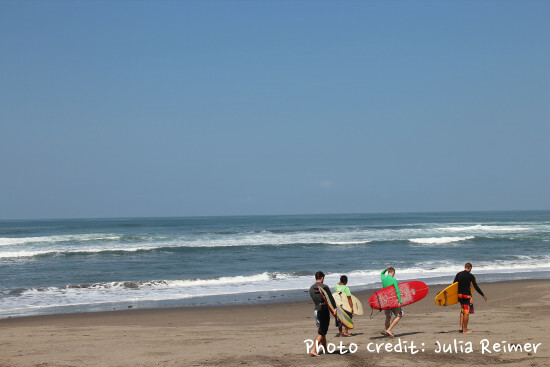 As you walk onto the beach you will be approached by locals to buy food, hand-made clothing and offers for surf lessons. The Patricks and I simply wanted to check-out the beach and work on our tan. We found a nice spot in the shade to leave our things and go for a swim. Following, we enjoyed a nice cold coconut. mmm… Life is good! 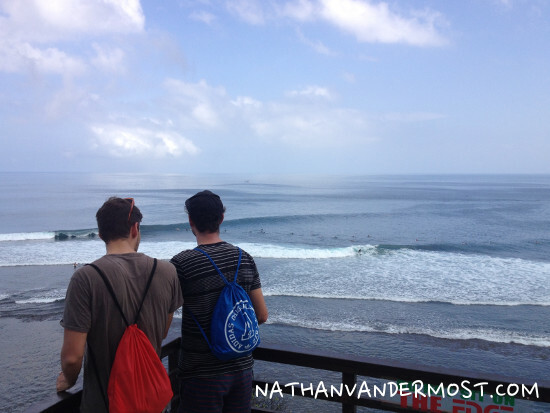 After spending most of the day in Uluwatu we headed back to Canggu in the late afternoon. The traffic was much worse compared to driving to Uluwatu in the morning. We eventually made it safely back to Canngu at the end of the day. Thanks to both Patricks for the invite! It was a solid day!